Basketball and Bauhaus: the two words that Riccardo Tisci nailed to his latest Givenchy cross, in a collection of first-degree finery that he paraded behind a circular schoolyard fence on a neon basketball court yesterday. 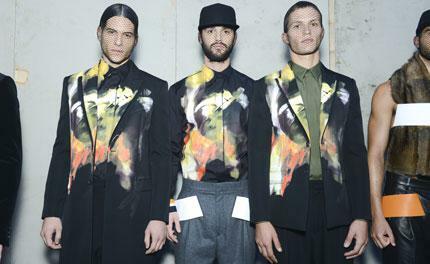 After the print-heady onslaught of Spring 2014, Tisci toned down the graphics and tuned up his tailoring, showing baggy trousers traced with basketball court markings and long, slim coats cut in velvet or shiny leather. Thick athletic stripes ran around pockets and hemlines, skirting the sleeves of a nubby angora knit or fixing a muskrat scarf to a mesh tank top like a training towel, carrying the courtside luxury with aplomb. Elsewhere silver zippers snaked down puffers and formal shirts to mimic the ribs of a basketball itself, exemplifying Tisci's aesthetic commitment to theatrics (however gimmicky) that continue to drive Givenchy's bold urban statement.